Florida Coach Roland Thornqvist holding the NCAA championship trophy after winning the 2012 title. Athens, GA- The Florida Gators are National Champions yet again. The #1 ranked Gators (29-3) defeated the Stanford Cardinal 4-1 to claim the program’s seventh title. The Gator jumped to a 1-0 lead by earning the doubles point after the doubles team of Anna Danilina and Ingrid Neel quickly won their first match. That victory was soon followed by Josie Kuhlman and Belinda Woolcock defeating their Cardinal opponents. Florida jumped to a 2-0 advantage when senior Kourtney Keega shutout her opponent 6-0 and 6-0 on court 6. Senior Belinda Woolcock also won her match in straight sets. The Australia native won by 6-1 and 6-3 scores on court 1. Stanford got on the board with the next result. Melissa Lord scored a victory over junior Josie Kuhlman 6-4 and 7-5 on court 2. Freshman Ingrid Neel clinched the victory for Florida. The Minnesota native rallied after losing the first set 5-7. Neel claimed the final two sets 6-3 and 6-2. 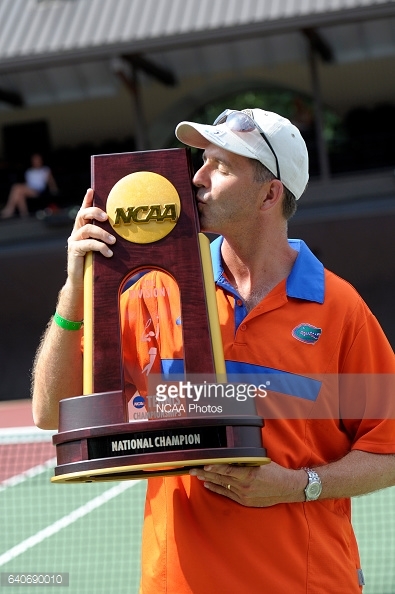 Florida head coach Roland Thornqvist has now won four national titles with the Gators. Monday’s final for victory over Vanderbilt was Thronqvist’s 400th win since taking over the Gators. Florida defeated UMass, Miami, Texas A&M, Oklahoma State, Vanderbilt, and Stanford in their journey through the NCAA Tournament.